I'd like to wish a Happy New Year to all of the Muse readers, and express thanks for all of the submissions, ideas and critiques you offered in 2013. Keep 'em coming! Chuck Petras sent this interesting link to a 1965 book about the the development of punch card tabulation. A couple of readers pointed to The Night Watch by James Mickens, which is a longish but funny and wonderfully-written story about the "joys" of system programming. 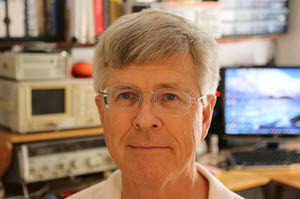 Pat Little sent this quote from the FORTRAN manual for Xerox computers: The primary purpose of the DATA statement is to give names to constants; instead of referring to pi as 3.141592653589793 at every appearance, the variable PI can be given that value with a DATA statement and used instead of the longer form of the constant. This also simplifies modifying the program, should the value of pi change. 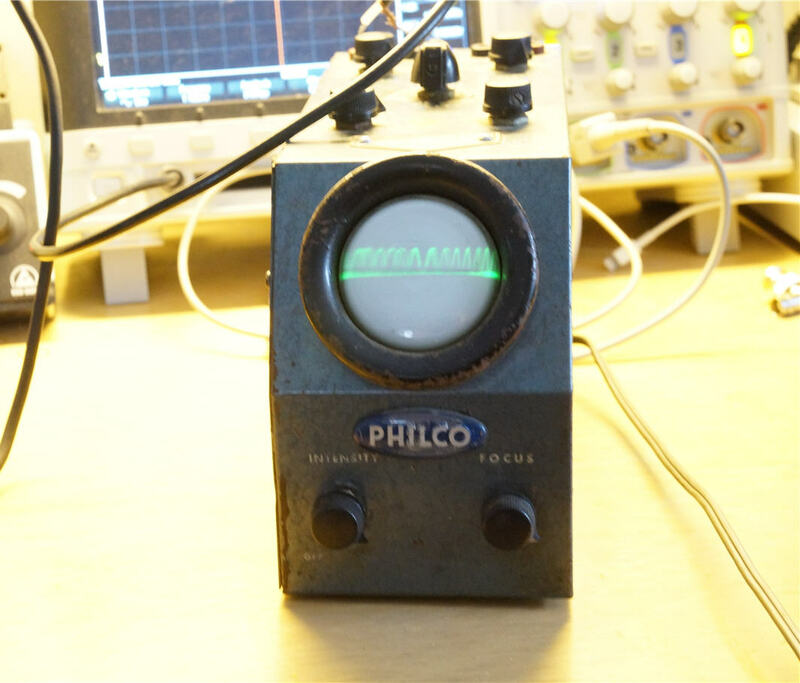 Succumbing to the wiles of eBay, I recently became the owner of a 1946 Philco 7019 oscilloscope, and thought some readers might be interested in how much test equipment has changed. Targeted originally at hobbyists and repair people, this device offers little in the way of performance. Rated with a 100 kc (kilocycle, used before KHz was common) bandwidth, strangely at -2 dB, and with 1 volt/inch of vertical and horizontal sensitivity. Notice the lack of any scale on the 2" CRT. It's impossible to make any sort of quantitative measurements. The time base is a free-running ramp. This predates trigger circuits; to freeze the waveform on the screen one adjusts the time base frequency, which is uncalibrated. A sync circuit feeds some of the signal to the time base to try and make the oscillator sync to the signal's frequency, but it can be hard or impossible to get a stable display. Note that there seems to be a DC line below the sine wave. That's because there's no horizontal blanking; that line is the sweep returning from right to left. The following shows the ramp that drives the beam from left to right. The ramp is rounded so the sweep isn't constant, as indicated by the squished sine wave display shown previously. I guess there are parasitics causing the nasty little pseudo-ramps. 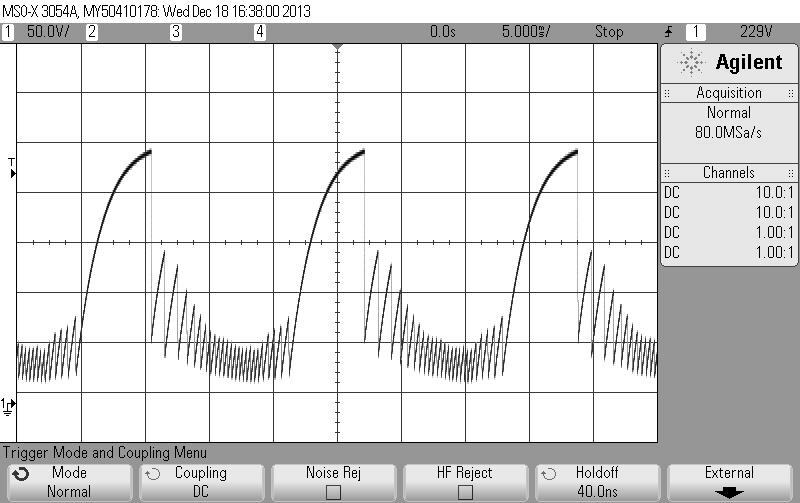 And look at the amplitude! That's over 200 volts, and I think it's the first time my Agilent has measured anything over 15V. 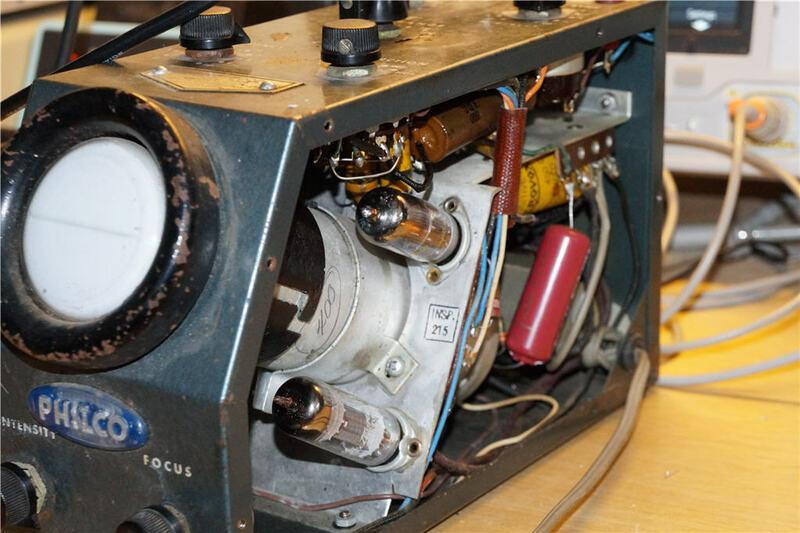 The unit has only 4 vacuum tubes: the CRT of course, one in the power supply, one for the time base (a dual triode 6J6) and finally a 6AU6 single pentode for the vertical amplifier. Though the performance is terrible the design is quite ingenious, and uses custom selector switches to minimize the number of capacitors required. Amazingly, the capacitors haven't dried out after 68 years. It's AC coupled so can't display the DC component of a signal. There are neither vertical nor horizontal position controls. Instead, one moves a magnet around inside the cabinet to direct the electron beam! It sold for $66 in 1946, which is about $790 in today's shrunken currency. That was probably a good deal back then; today, for the same price, one can get a pretty good Rigol digital scope, or even a decent brand-new 40 MHz Tektronix. You can find some pretty good eBay deals on used scopes, but other than for historical interest, stay away from anything like this Philco. Triggered sweep and the ability to make amplitude and time measurements are both absolutely required for any sort of serious or even hobbyist work. But this bit of history is certainly fun! In 2000, I was writing software for a medical device which used recyclable "cartridges". These cartridges were calibrated in our office in Houston and flown to hospitals worldwide. The calibration data was stored in a 2Mb SRAM module. Soon after commencing operations, we began experiencing CRC errors on the calibration data, requiring the cartridges to be rejected upon delivery and to be returned unused. This was a serious issue because the cartridges contained an expensive-to-manufacture, rapidly-decaying radioactive element which was useless by the time the device was returned. In the beginning, all we knew was the memory was corrupt. Our leading theory blamed the SRAM manufacturer for faulty memory. It wasn't until I flew to Vienna, Austria to investigate a failure on-site that we got our first clue. I dumped the entire SRAM image to disk and found our data intact. So I examined the unused, but erased, memory. That is when I noticed a single bit flipped in nearly 2M of memory. A little research led me to discover SBU's encountered in space craft. Plotting our failures on a world map provided support for the theory. The farther the shipping destination was from Houston, hence longer time flying at 35,000+ feet, the more likely the occurrence of corrupt memory. I proposed a Hamming code solution but ultimately we chose to simply save a copy of the calibration data in FLASH (which we had available) and simply restore corrupt memory upon boot up. Problem solved. As a side note, when I first presented my "cosmic ray" theory, several engineers literally laughed out loud. I've been looking at newer dual lock step microcontrollers, nominally developed for safety critical (ASIL D) automotive applications. One case is the MPC5643L: (dual lock step e200 cores) . Another is the Hercules series TMS570LSxxx (dual lockstep Cortex-R4F cores) The point of the dual lock step operation is to detect hard or soft upsets or other bit level faults. With this architecture, there is a high degree of confidence that bit errors are detected, but there being only 2 cores, one fault results in loss of function. With this limitation in mind, quad-core, "double dual" lock step 2oo4 microcontrollers are under development. (what I call "pair and a spare") If one lock step pair detects a fault, the other pair carries on. A feature of these products is end-to-end ECC -- from reading a word from memory, through all internal bus transfers and computations to writing a word to memory, background silicon automatically corrects and reports single upset events and automatically reports dual upset events (cf. Hamming Code). These designs in particular address the concerns of ISO26262 diagnostic coverage of hardware by hardware BIT. If he had thought to send it to the printer, he would have needed 455 reams of paper and would have had to pause to change the toner cartridge 91 times. It would have taken a little over a week to print the value using a consumer-grade laser printer counting printing time and time to change the toner cartridge. I didn't consider time to add paper--maybe assume two alternating trays and loading while printing. He won't get much sleep either, having to load paper every 25 minutes. Sort of reminds me of the way Lavabit (Edward Snowden's email provider) delivered their SSL key to the NSA in page-printed format. 1) I will work hard to elicit correct specifications, insofar as humanly possible, before starting a project. 2) I will work with the hardware people to produce firmware-friendly hardware. 3) I will carefully document all of my code, including tests and prototypes, as prototypes have a nasty habit of becoming products. 4) I will collect metrics about bugs and examine their root causes. 5) I will carefully measure the real-time behavior of real-time code, like interrupt handlers, to insure adequate margin and to improve my time-domain estimates. 6) My tests will be extremely comprehensive, and will check boundary conditions. 7) I will petition management for funds for high-quality tools. 8) I will write warning-free code. 9) I will not use global variables unless there is no alternative. 10) I will continue to study the fascinating world of software engineering. 11) I'll keep having fun!